AKRON, OH -- (MARKET WIRE) -- August 29, 2006 -- While the incidence of most sports-related injuries has been holding steady for the past two decades, injuries to the anterior cruciate ligament (ACL) continue to increase significantly, particularly in female athletes. In fact, on many college teams, as many as 30 to 50 percent of young women have had an ACL injury during their high school careers in certain sports, such as basketball, soccer and gymnastics. Watch pediatric orthopedic surgeons at Akron Children's Hospital perform arthroscopic surgery to replace a young athlete's ACL during a live Webcast on www.OR-Live.com Tuesday, Oct. 17, 2006 12 PM EDT. Kerwyn Jones, M.D., will perform the surgery, while Mark Adamczyk, M.D., will serve as the Webcast moderator. The ACL is one of four ligaments designed to stabilize the knee joint. The ACL -- which helps control forward motion and rotation -- connects the femur (thighbone) to the shinbone at the center of the knee. It is the most commonly injured knee ligament. In previous years, there was concern about younger patients undergoing ACL surgery due to the risk of interrupting the growth plates. However, pediatric surgeons have perfected procedures that make it safe for children as young as 11 years old. "While non-surgical options focus on strengthening the quadriceps and hamstrings to stabilize the knee, most patients aren't able to return to their previous level of play," says Dr. Jones. "ACL reconstruction surgery, on the other hand, allows for a full return to activities and sports in four to six months." During arthroscopic surgery, the orthopedist makes a small opening in the knee and inserts a tiny tube-like tool called an arthroscope into the joint capsule. The arthroscope has a lighted video camera on the end, and is wired to a monitor the surgeon watches while moving the scope to determine the exact knee problem. 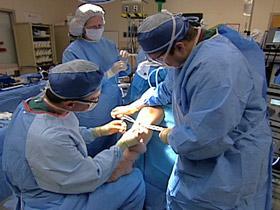 Most of the time, the orthopedist is able to fix the problem during the procedure. Visit http://www.or-live.com/akronchildrens/1565 now to view a program preview. ACL surgery allows for a full return<br>to activities and sports in four to six months.